For a family, staff and pet safe pest control services for residential and commercial needs, choose SWAT Pest Control. We specialise in end of lease and rental property pest control. Do not let your family and pets suffer the consequence of pest infestation! When planning to get a pest control specialist, you should hire someone who delivers an effective and safe service at the same time. It is a must to consider the health and safety of your staff, family, baby, and pets. Eastern Brisbane's pride, SWAT Pest Control consistently provides effective family, staff, and pet safe pest control services. Founded by Max and Samantha Messina, we have been helping residential and commercial clients requiring home and business pest control and prevention. Max is working in a pest control industry for over 11 years, which makes him savvy about how the pest infestation process works. He is adept in terms of the latest technology and the safest and the most effective products to use. As experts, we only use clear drying, non-staining, and odourless pest treatment solutions. SWAT Pest Control normally assist residential and commercial clients who are facing troubles against cockroach, silverfish, ants, rats, rodents, mice, wasp and spider. When these types of pest invade your home, you do not need to vacate it. 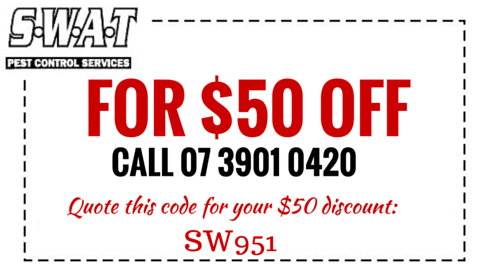 All you have to do is contact the best in domestic pest control in Eastern Brisbane for a full barrier treatment, none other than SWAT Pest Control. We ensure that getting our service will certainly deliver your home out from a tremendous pest invasion. By using the right solutions, we can guarantee that our house pest control procedure is effective and safe! Professional technicians from SWAT Pest Control are also skilled in doing end of lease pest control and rental property pest control. Fully licensed and insured, they will arrive on time as scheduled when you call. With SWAT Pest Control, you do not have to worry about terrible smell within your home or office. Get rid of any unwanted visitors today! Contact SWAT Pest Control!